Into PSP, slight USM to pick out the birds, resize, save for web. Very nice. I suggest makes the horizon more straight, but that might now have been possible with the landscape, I'm not sure! This has a ver nice feel to it. Neat subject. 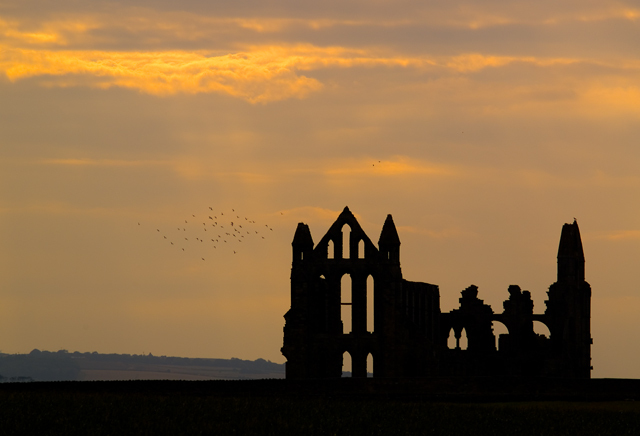 Very nice composition and the remains of the abbey lend themselves very well as a silhouette. Lots of other smaller details I like that add nicely without getting to busy with the flock of birds, detail on the hill in the background and the light on the upper clouds. Well done! I like the flock of birds, adds something to it. THOSE BIRDS REALLY ADD TO THE PICTURE. Proudly hosted by Sargasso Networks. Current Server Time: 04/23/2019 08:01:42 PM EDT.